Costa Rica has made a name for itself with its National Parks and protected areas. Monteverde combines beautiful cloud forest with excellent tourist infrastructure. 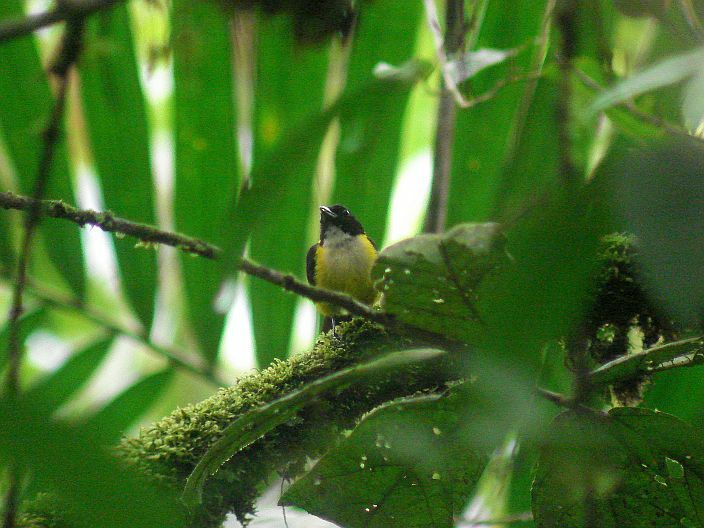 Carara offers exceptional birding at the junction of humid and dry ecosystems. The Pacific beaches of Manuel Antonio are set against a rain forest backdrop. Wild and rough Braulio Carrillo, though, is my favorite. I admit I could be biased because this was the first place I experienced rain forest. 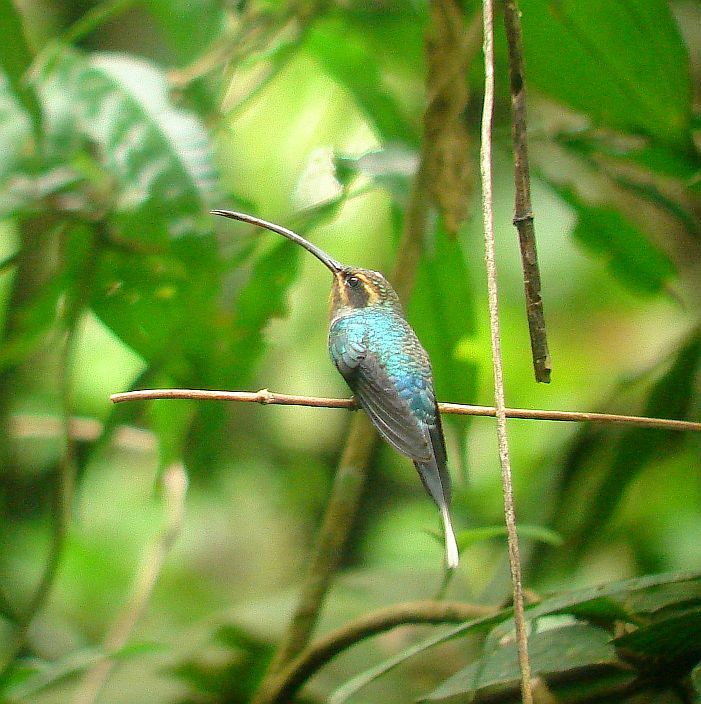 The first place a White-necked Jacobin appeared out of the jade green surroundings to hover in front of my face. 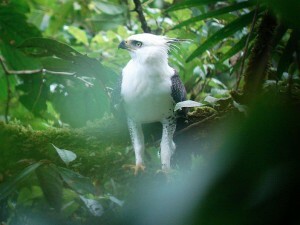 The first time I saw a White Hawk and a King Vulture; breathtaking neotropical bird species. In addition to exciting birding in fantastic primary rain forest on every visit, I might also be biased because I could get there so easily; less than an hour from San Jose on any morning bus to Guapiles. Like most rain forest birding, some days are slower than others, you can easily get rained out for the entire day, and seeing the birds can be a serious challenge. Although I sometimes feel that the birding was better in the past (I used to see more Tinamous and Quail Doves), its still my favorite spot as well as my birding patch here in Costa Rica. The place is especially good for large mixed flocks led by White-throated Shrike Tanager. While I took pics of this male, the surrounding vegetation resounded with the calls of various Tanager species, Woodcreepers, Russet Antshrike, Scarlet-rumped Caciques and others. 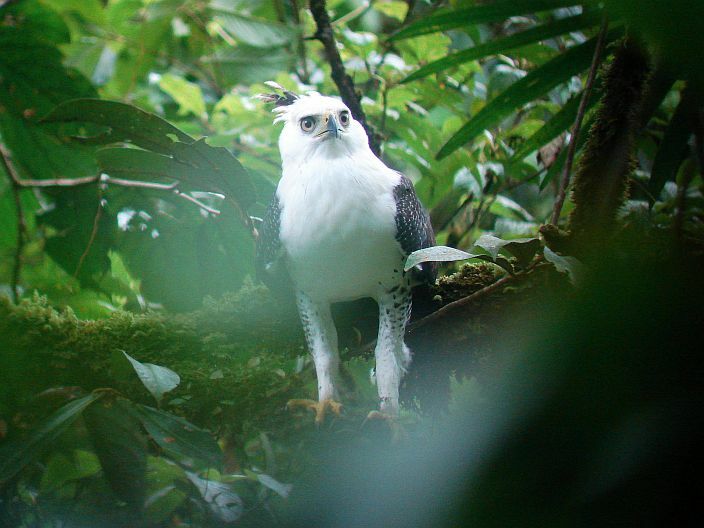 On my last visit, I got some lucky shots of this juvenile Ornate Hawk Eagle. 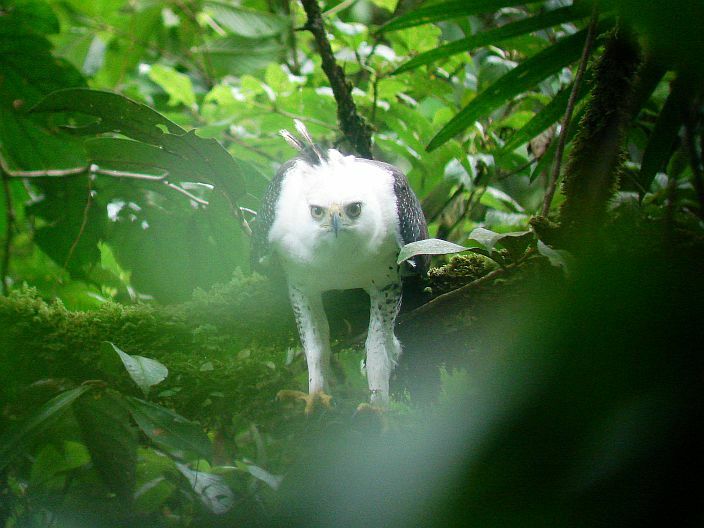 and here this formidable predator looks like it is about to attack! In the Amazon, these guys are one of the main predators of Squirrel Monkeys and Macaws. A friend of mine saw one catch a Curassow- same size as a Turkey. Quebrada Gonzalez is probably one of the easiest places in Costa Rica (and elsewhere) to see this spectacular raptor. Ornates are often seen in flight from the parking lot on sunny days from 10 AM to 12 noon. My patch is also one of the best sites to see Black-crowned Antpitta. Well, to be honest, they occur here but are very difficult to actually see. 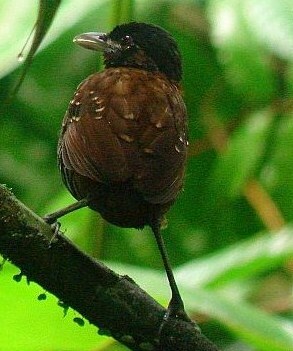 While this male sang, a Little (Stripe-throated) Hermit buzzed around in front of the Antpittas face. It acted as if the Antpitta was a threat! Green Hermits are the most common hummingbirds here. 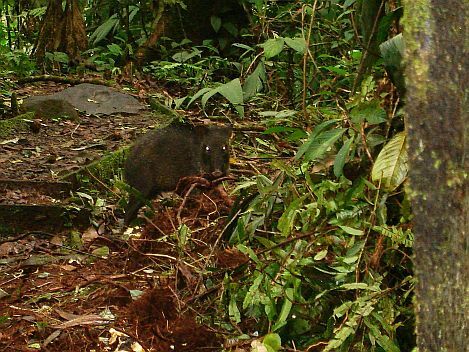 I often see White-faced Capuchins, Spider Monkeys and other animals such as this diabolical looking Collared Peccary. 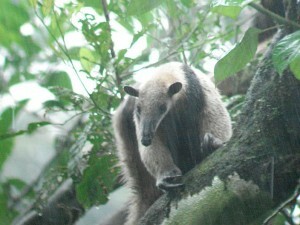 One rainy day, this Northern Tamandua was hanging out next to the ranger station. I always usually see some cool lizards. There are two trails; a well maintained 1 k. loop trail behind the ranger station and two longer loop trails across the highway that lead down to the river. The one behind the station is easiest, the trails across the highway sometimes blocked by fallen trees. They are open from 8 AM until 4:30 PM and cost $8 for non-residents, $2 for residents. Quebrada Gonzalez is found along the highway from San Jose to Guapiles about 4 ks after the bridge over the Rio Sucio. By bus, take any bus to Guapiles from the Caribeños bus station and tell the driver to let you off at Quebrada Gonzalez. To get back to San Jose, flag down any passing bus; some stop, most don’t. Congrats on the birth of your child, Pat. With a 4 and 2 year old of my own, I can tell you that kids definitely cramp your birding style but they’re still worth it! Outstanding photos. I can’t get enough of the Neotropics. 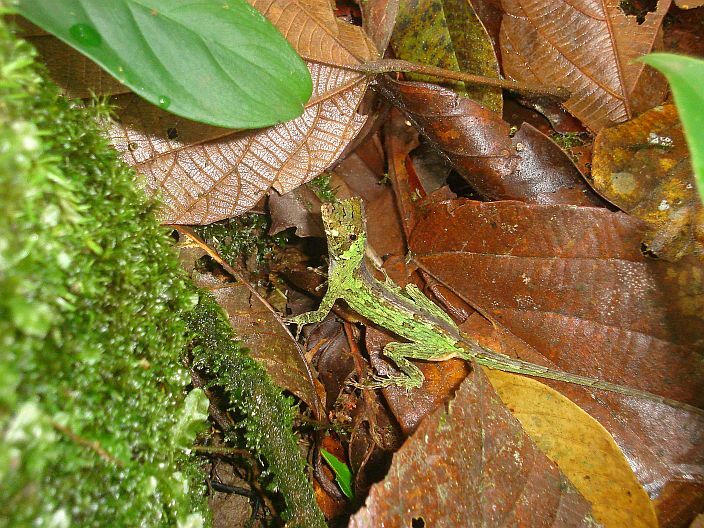 We’re fortunate to finally have a nature blogger in the heart of Costa Rica. great blog you have here, keep it strong! congrats on becoming a daddy! Im adding you to my blogroll, love your blog!